Bradley C. Poulos has represented clients in complex personal injury cases involving motor vehicle accidents and premises accidents since joining Cantey Hanger in 1985. 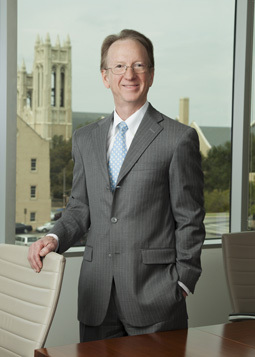 He is licensed to practice law in Texas and Arkansas. Associate Editor, Baylor Law Review 1977-1978. Moot Court, Order of Barristers. B.A. in Political Science, 1976. Dean’s List, Fall 1975 and Spring 1976. Defended numerous insurance companies and their insureds in cases arising out of motor vehicle accidents. Defended numerous insurance companies in cases involving uninsured and underinsured motorists coverage. Defended numerous insurance companies in cases involving allegations of bad faith and other extra-contractual claims. Defended grocery stores and other premises owners and occupiers in slip and fall cases and sexual assault cases. Defended manufacturers in complex products liability cases.